The death of Angus McIntosh on October 26, 2005, brought to an end an ongoing contribution to English studies which began shortly after the end of the Second World War. Many great scholars are only properly celebrated posthumously, but in Angus’ case, the University of Edinburgh, to which he devoted himself throughout his career, finally recognised his achievements in the award of an Honorary D.Litt. in May 2004. The current holder of the Forbes chair, which Angus inaugurated in 1948, is Heinz Giegerich, and he gave a eulogy in Angus’ presence which summarises very succinctly his main contribution to language work. It is appropriate with a scholar of such breadth and open-mindedness as Angus that what Prof Giegerich distils into a single phrase heralds the beginning of a new approach to language science. About Angus’ wartime experience on the famous Enigma project, Giegerich says “he foresaw the potential of computers as a tool to aid linguistic analysis”. 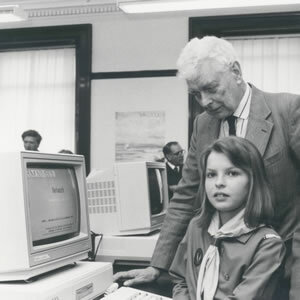 Computers only became available for academic research in UK in the sixties, and before his University had even acquired one, Angus had several projects running in his Department. One was devoted to building a substantial corpus of transcribed informal spoken English and studying the co-occurrence patterns of the vocabulary. Angus was the first director of this project, and its design reflected the attitude of open enquiry that characterises so much of his work. Electronic corpora were unknown, transcribed speech was a novelty and a revelation, what computers were available were puny and only really understood numbers – yet Angus stepped out into the unknown, and began a research tradition which, even after more than forty years, continues in the SCOTS project among others, and is distinctively open-ended and broad in its scope. The report of that sixties project, with acknowledgement to Angus McIntosh, was republished in 2004 by Continuum, under the title English Lexical Collocations, edited by R. Krishnamurthy.